While there are so many charges that appear on your bill, not everything goes to Meralco. That’s right - only about 17% of your bill actually goes to the company. 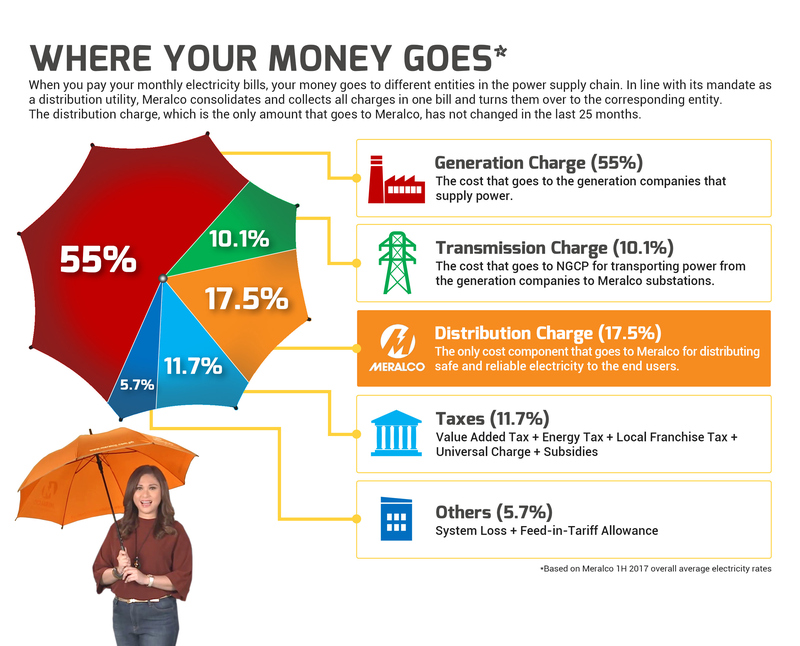 Meralco is responsible for gathering all these charges and simplifying them, so you won’t need to worry about the many different entities collecting payment from you. Here’s a guide to help you understand what each of these charges mean, and where they go. This is the charge for the cost of delivery of electricity from power suppliers – usually located in other provinces or in remote areas outside the distribution utility's franchise area – to Meralco’s distribution system. This is paid to the National Grid Corporation of the Philippines (NGCP), the transmission service provider. This refers to the cost-recovery of power lost due to technical and non-technical system losses. The maximum level of losses that may be recovered by private distribution utilities was set at 9.5% by Republic Act No. 7832, which was reduced to 8.5% starting 2010, as provided under ERC Resolution No.17, Series of 2008. This is the only portion of your bill that goes to Meralco. It covers the cost of developing, constructing, operating and maintaining the distribution system of Meralco, which delivers power from high-voltage transmission grids to commercial and industrial establishments and residential end-users. This is for the marginalized, low-income customers and senior citizens who consume up to 100 kWh in a given month. They can enjoy a discount of up to 5%, an amount which is subsidized by all other customers. Under Subsidies, Tax Recovery Adjustment Charge is also included. It is the charge collected from customers of the different local government units where local franchise taxes, prior to rate unbundling, were already paid by Meralco but not yet recovered from customers. This is the charge for the cost of reading, operating and maintaining power metering facilities and associated equipment, as well as other costs attributed to the provision of metering service. This is for the cost of rendering service to customers such as billing, collection, customer assistance and other associated services. This is paid to local government units, in accordance with the provisions of Sections 15 and 137 of the Local Government Code. This is a pass-through charge for Meralco, paid and collected in accordance with ERC Regulations. This is a consumption tax imposed on the sale of electricity and related services through all stages of generation, transmission, distribution and sale of electricity to the final consumer. This is an LGU-specific charge collected from customers of the different local government units where local franchise taxes, prior to rate unbundling, were already paid by Meralco but not yet recovered from customers. Last April 2012, billing of TRAC began in accordance with the ERC approval in its Decision under ERC Case No. 2011-045 RC. Missionary Electrification Charge is a universal charge to fund the electrification of remote and unviable areas, as well as areas not connected to the transmission system. Environmental Charge is a universal charge that accrues to an environmental fund, which is used solely for watershed rehabilitation and management. This fund is managed by the National Power Corporation (NPC) and is pegged at PhP0.0025 per kWh. Stranded Contract Cost of NPC refers to the excess of the contracted cost of electricity under eligible IPP contracts of NPC over the actual selling price of the contracted energy output. Feed-in-Tariff Allowance is an additional tariff, imposed on consumers of electric power, to be paid to producers of renewable energy. Because most forms of renewable energy have very high development costs, an extra financial cushion is needed to help renewable energy developers recover their costs. 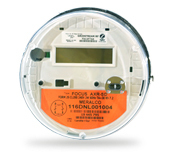 Reading your meter is crucial in determining your bill. The amount you have to pay on your bill is based on the reading registered on your meter, which the meter reader records into your account. An incorrect reading results in an incorrect bill. There’s no need to worry though; our meter readers are trained to accurately read your meters! They also use tools such as binoculars and digital cameras to help them capture the reading of meters installed in inaccessible or elevated places. Your meter is read every month. There are two kinds of meters: digital meters, and electromechanical meters. Digital meters records electricity usage in the same way that a car’s odometer records mileage. You read the numbers from left to right. In the illustration below, your March reading is 3879 kWh and your April reading is 5768 kWh. Electromechanical meters, on the other hand, have a minimum of four dials that record your electricity consumption and reading this meter is as easy as one, two, three! Stand directly in front of your meter and look at the four dials (A,B, C and D). Note that these four dials move in opposite directions. Dials A and C move counter-clockwise, while Dials B and D move in a clockwise direction. Read and record the number from each dial starting from right to left – starting from D to A. In this example, the reading on the meter is 5941. This will be the “present reading”. Just subtract your meter’s previous reading from the present reading. The difference is the number of kilowatt hours that your household has consumed since your last billing period. Can Meralco pull-out my meter? What are the other important things I should know? It is equivalent to the customer's estimated billing for one month, which will initially be based on a customer’s estimated electricity consumption, or the customer's load schedule, provided upon application for electric service with MERALCO. It may be adjusted yearly based on the actual average monthly consumption of the customer. AUBD (Annual Update of Bill Deposit) - Through the AUBD, Meralco determines if the bill deposit is enough to cover the customer's average monthly bills, and to update it, if necessary. Accrued interest shall be applied to bill deposit adjustments. 2. Through refund to customer of any amount beyond the required deposit. Your bill deposit may be refunded if the amount paid is greater than the average bill by more than 10%. If the bill deposit is less than 10%, additional deposit will be required. If the amount falls within the allowable difference, then you will be exempted from additional collection and will not be eligible to apply for a refund. This review is done during the anniversary month of your Meralco service contract. To find out if you are still eligible for the AUBD program, you may call our hotline, 16211.